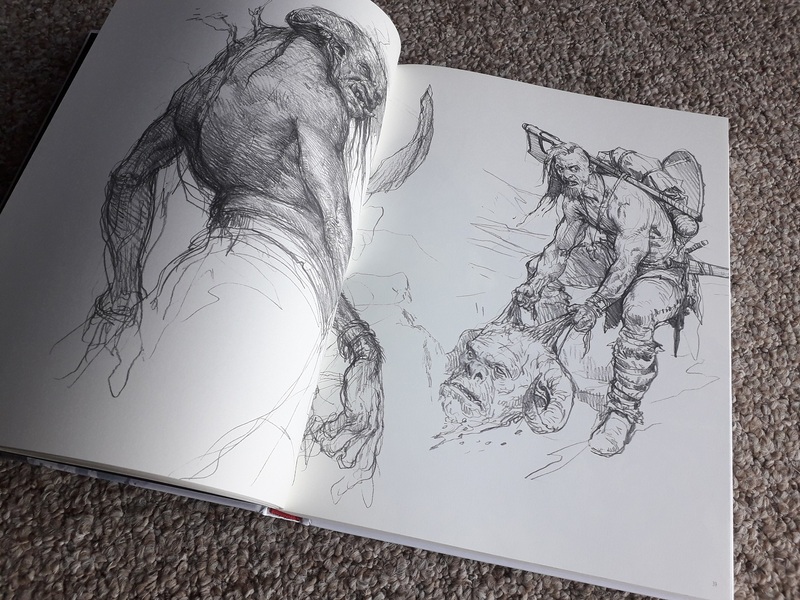 The Big Kopinski is the first volume in a series collecting sketches by the artist Karl Kopinski, who you will likely know from his work on the card game Magic the Gathering. I mean, that’s certainly from where I was familiar with the guy! Among so many other iconic images for that game, he also produced the wonderfully evocative artwork of Liliana that was used as both box art and playmat art for the Innistrad set, and is without a doubt a classic rendering of the infamous Planeswalker. I started to play Magic seriously around the time of Origins, and learned the basics of the game from watching Spellslingers season 2, as well as playing via the Android app. 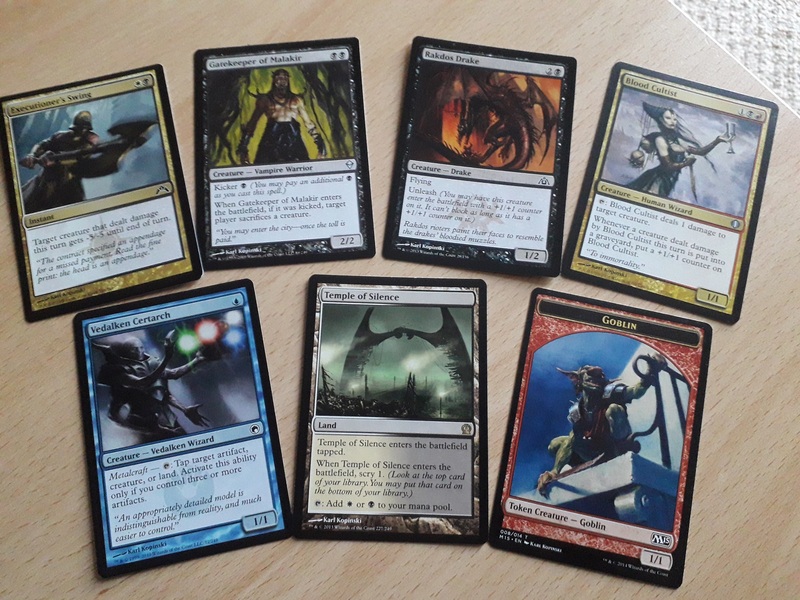 The app uses a number of cards from M15 and earlier, and playing a black/red deck, I became familiar with Kopinski’s style though a lot of these cards. That Goblin token in particular is one that I feel should be on my Christmas card list, I am so used to it by now! But let’s look at the book itself. 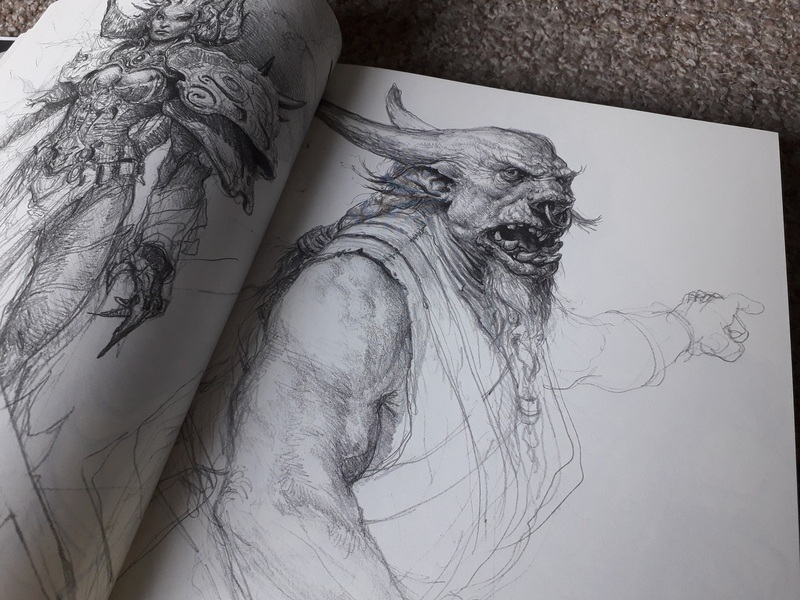 Like I said, it is principally a book of sketches that range from the fantastical and the futuristic to the more mundane and the realistic. 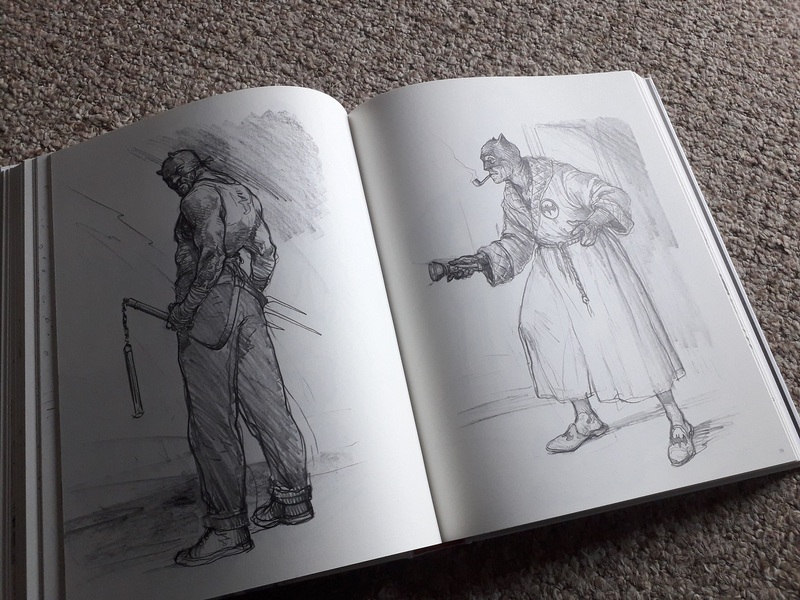 It’s a fascinating collection of drawings that is an utter delight to leaf through. Even if you aren’t familiar with the man’s work, it’s a really nice book that is a treat for the senses, one that you can lose yourself in as you study the worlds created on the pages. I was really taken by that guy dragging the demon-head, shown above, imagining all kinds of scenarios it could be illustrating! This is truly a fantastic piece of artwork, whether you think it unfinished or not. That face! The textures Karl uses on the skin feel so real, and the detail just brings this piece to life off the page. I couldn’t help but gaze intently at this dude, again, imagining all manner of worlds and situations he could inhabit. It’s just fabulous, and a really great example of the hundreds of others across these pages. You can see more samples of his work (and purchase any you like the look of!) from his website, here. I am very grateful to the publisher of this book, editions caurette, for sending me a copy to review here on my blog. All of the sketches used to illustrate this blog were taken from the book, as was the quote at the top of the page. 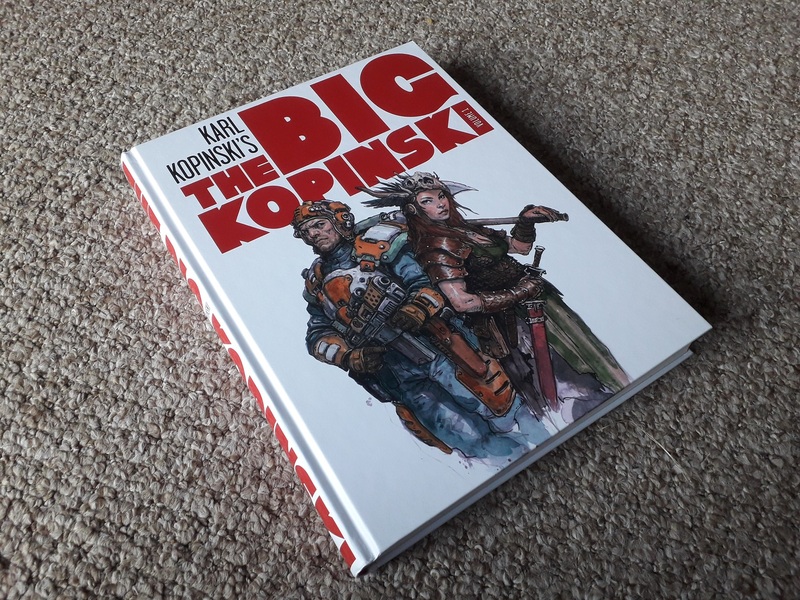 You can pick up a copy of The Big Kopinski direct from the publisher, here. So yesterday, I was talking about some of my thoughts around some new army builds that I’ve had going round in my mind for the last few days. There have been a lot of such thoughts, so it’s been a busy process! 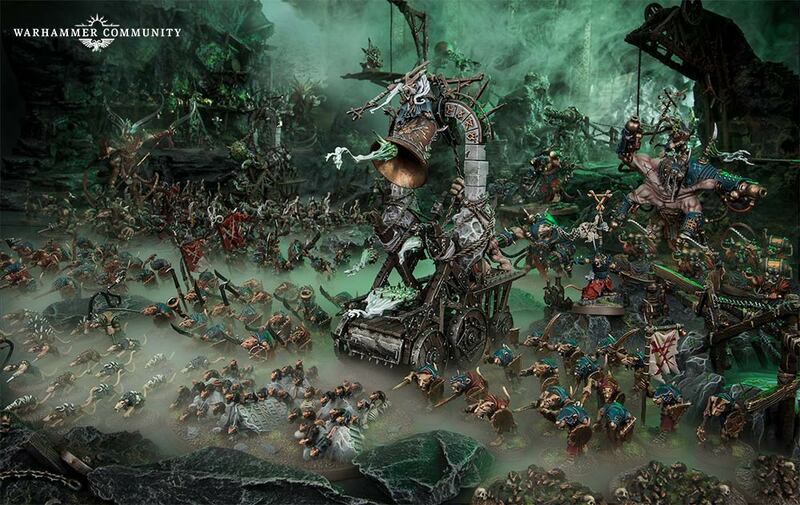 To begin, I want to talk about my plans for a Legions of Nagash army. This has pretty much evolved out of the desire to build up Arkhan the Black – I’ve loved this model since he came out, and have wanted to do something with it despite having bought and sold it twice! When I first had it, I was leaning towards Neferata, though now that I’m thinking more in terms of the rules and how I want the model to work within the wider context of an army, I think Arkhan would work well with the magic emphasis and so on. 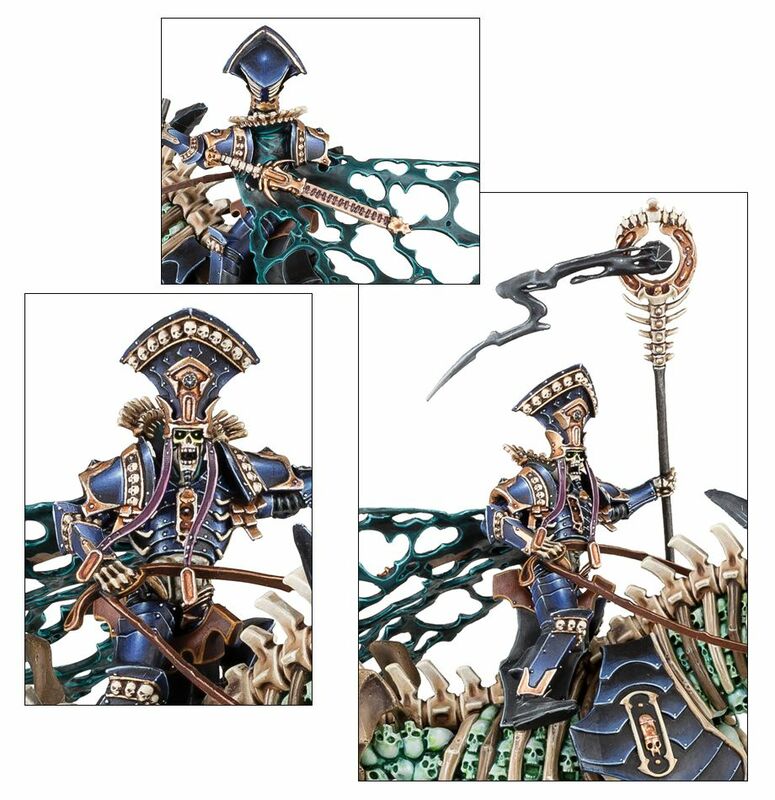 Wanting the model to go alongside my existing Nighthaunt project, it seems like I need to go with Legions of Nagash and then ally the majority of the Nighthaunt in – luckily, everything from the Soul Wars box can be put into the army, so it’s not too much to faff about with. I love the Spirit Hosts, as well, so I wanted to use a lot of them – and luckily they’re already in the battletome, so no need for this allies stuff! I’m currently splitting the battleline units between the Chainrasps and the Skeleton Warriors, the usual battleline units for the undead. 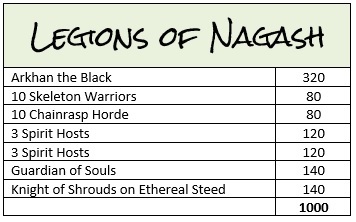 I really enjoy the Legions of Nagash battletome, and I was quite impressed at the number of options available when first flicking through it. However, when it came time to actually go through the rules for everything, I felt a little bit underwhelmed. I’ve gone for the Legion of Sacrament because of the fact that Arkhan is in the list, but it was really surprisingly difficult to come up with the organisation of it all. I’ve given Arkhan the command trait Dark Acolyte, which basically allows him to know one more spell. Being a wizard, of course, he knows all of the spells of Death Wizards within 18″ of him, so he can also benefit from the Guardian of Souls, so I’ve gone for a couple of quite offensive spells to help keep the enemy at bay. Well, we’ll see! Along with the ghosts, I’m wanting to get myself moving with the Idoneth Deepkin that I started building up late last year. Much like with planning the Legions of Nagash, I’ve been finding it quite difficult to come up with an actual army list. Some things really felt quite natural to go together, such as the Namarti Thralls along with the Soulrender. 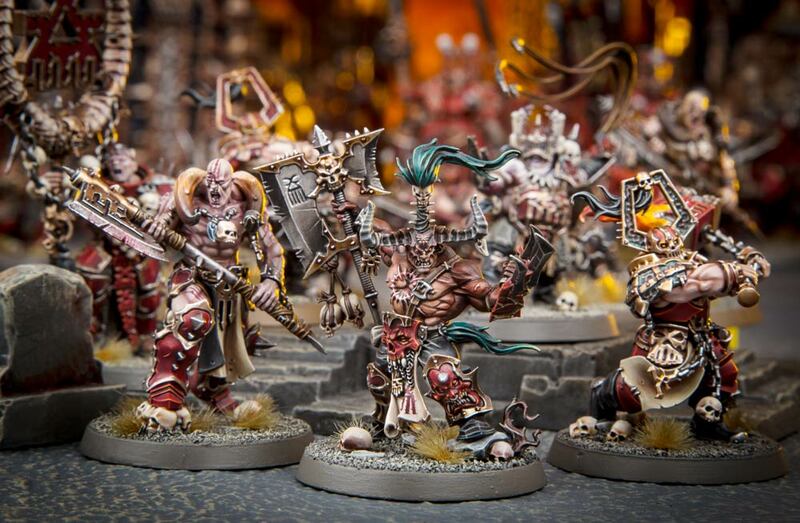 But it has proven quite difficult to get something more of a cohesive army that I would like to play with. 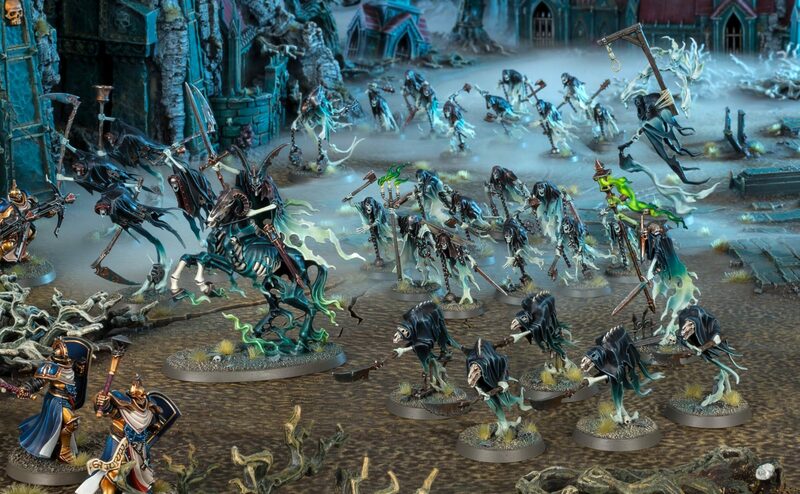 I mean, I like the sorts of armies that have a lot of variety in the units – just look at the Legions of Nagash army above! 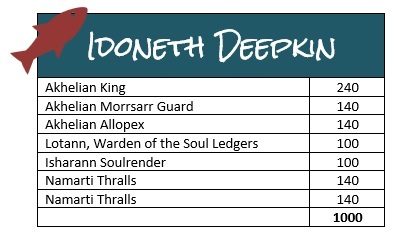 – but the Deepkin feel like the sort of force that would quite happily be made up of massive amounts of the same sort of unit, be that Thralls or Guard. I’ve chosen the Mor’phann Enclave, more because I like the colour scheme of blues and purples, but it also adds a buff to the Soulrender bringing Namarti models back. Again, I found it difficult to pick artefacts and command traits to ascribe to the units, so I have just gone a bit generic for the time being, while I build up the army and attempt to get some games in to try to get the hang of what they all want to do. More so than any other Age of Sigmar army that I’ve come across so far, I feel the Deepkin might benefit from having allies within the force, especially Sylvaneth. Daughters of Khaine would be a wonderful excuse to start getting myself some snake ladies, of course, but I can see myself getting some Kurnoth Hunters sooner or later to pepper into the force. It’s been really interesting to me, getting back into Age of Sigmar after all this time. If you remember, I was really into it back when the system first launched, despite so much negativity being leveled at it across the internet. Painting up a massive amount of Stormcast Eternals was quite a joy, now that I look back, though I never really got into the actual gaming side of things before 40k took over my life. I think this is in part due to the fact that the fantasy scene at my local GW is highly competitive, with most of the players regularly taking part in all manner of tournaments and whatnot. The opportunity to have small-scale games just for fun were very few and far between, and I would get quite nervous even thinking about playing. So I think it’s been really nice that I’ve been able to find at least a couple of people locally who are now getting into it all at the same time, and have smaller-scale, casual games where it’s not too dramatic as we’re only playing for the fun of it, and all that. I suppose it’s an aspect of the hobby that I don’t always talk about, but I do get quite nervous when meeting new people to play games with, as I think part of me is concerned whether they’ll be taking it too seriously, and whether I’ll just annoy them with my casual attitude, etc. But I do tend to over-think some things like this!! Going back to re-discovering the game, I think AoS 2.0 is a lot better than the first iteration of the game, just because of the depth gained from Allegiance Abilities and so forth. 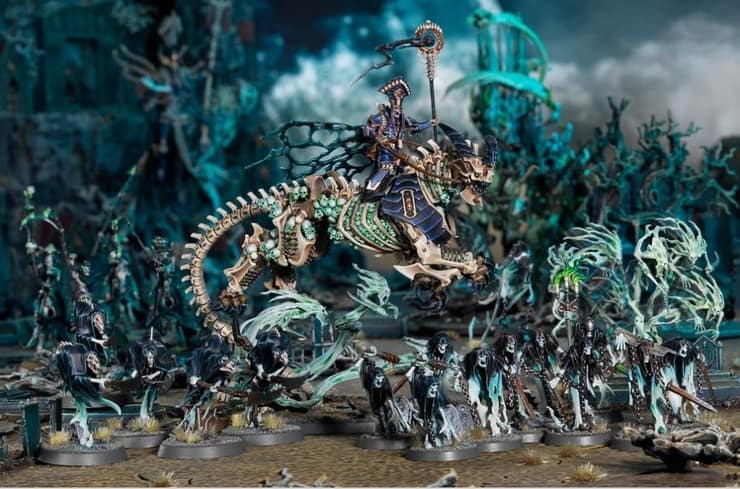 They’re basically Chapter Tactics for the fantasy world, of course, but I love the richness that we’ve gained from seeing these things, and while I have made a few comments up above about both Legions of Nagash and Idoneth Deepkin being a bit of a let-down in this regard, I do strongly feel this is more due to my lack of experience with both the game and each army, rather than any true reflection of things. I’ve also been enjoying painting something different. 40k has been with me for so long now that I feel a bit of a release painting the ghosts, especially because they have such a fantastical feel to them. While of course there is always creative licence in these matters, I feel much more freedom when painting the fantasy minis to when I’m painting those for 40k. It’s been really quite fun so far, and I’m hoping that continues for a long time to come! Well, it’s only been a week since the start of the year, and all my grandiose plans for what I’d like to do hobby-wise in 2019, but I’m quite pleased to announce that I’ve already been making some great progress with a couple of these plans! I had my first game of the year earlier today, with my New Year/New Army project, and it was Age of Sigmar, to boot! Nighthaunt vs Maggotkin, just a 500-point game to get into the swing of things, as it were, but it was a lot of fun, and I’m looking forward to getting more fantasy games under my belt as the year goes on! I primed the models with Corax White – never a fun thing to do, but between a lot of shaking, and warming it on the radiator first, I managed to escape having the dreaded powdery coating! Everything has then been shaded either with Nighthaunt Gloom, Drakenhof Nightshade, or Coelia Greenshade, to try and achieve a variation of spooky looks across the army. Some models I had painted the cloaks either Ionrach Skin or Celestra Grey, which gives a slightly different finish to the shade than simply shading the primer. There is quite a random look to them, which I do quite like – I don’t want to have a uniform look to my ghosts! I then drybrushed them mostly with Ulthuan Grey, though some were also drybrushed with Deepkin Flesh. I’ve tried to go over most of the “skin” with Drakenhof Nightshade, to give a bit of unity with the Thorns of the Briar Queen warband that I had painted up last year, though I’ve also just left them as they are. The texture of the models is really quite wonderful for drybrushing, and it has resulted in some quite decent-looking tabletop miniatures already. Last night I then went in and painted all of the rocks with Mechanicus Standard Grey, and some of the bases had been done with Astrogranite. I’ve then shaded the rocks with Nuln Oil, and I’ll probably go back in with Dawnstone as a drybrush to finish that off when I’ve done all of the basing. I’ve then tried to focus my attention on doing the metalwork on a couple of the models, painting it all with Leadbelcher (and then picking out a few bits with Retributor Armour) before shading everything with Agrax Earthshade. I chose the brown wash mainly because I’d misplaced the Nuln Oil, but I think it actually looks pretty good for them – the weapons, certainly, need to look dirty and stuff! So I quite like how that has turned out. I’m hoping to continue to plug away with these for a while, anyway – I really want to make sure I get the battleline troops painted up alongside the heroes, rather than focusing my attention on the single-models and then finding myself losing interest in the main troops. I’m not 100% sure yet how I’m going to paint the Knight of Shrouds, as I do want to make him something of a centrepiece (until I get Nagash!) but I feel that the fairly simplistic scheme that I’ve been using for the Chainwrasps would also do quite well for this chap, as well! I’ll continue to ponder while I paint the others, anyway, and we’ll see from there! So I’ve started really small, with just 500 points, although that is already 23 models! But I’m building up to a much larger list – as I have a lot of Nighthaunt models already, I’m thinking that I might as well build up towards 2000 points, plan out that list, and then focus on painting it up in sections like this. However, list-building in Age of Sigmar is a bit different to how I’m used to, with different considerations to keep in mind! 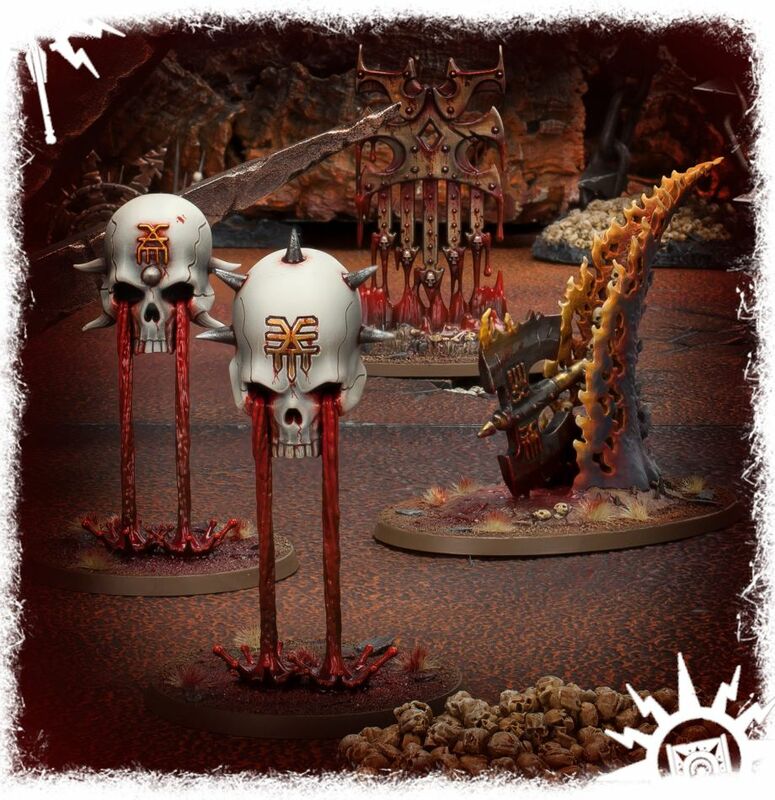 For those of you who don’t know, there is a Command Point system in AoS similar to that of 40k, in that you can spend your points to grant different effects, although it’s a much more pared-back version of the 40k system. I think pretty much the majority of Hero models in an army will have a Command Ability, although there are three generic Abilities that can be used by any Hero if he is your General. Each costs 1 Command Point to use, and you can use the same Ability in each round if you have the points to do so. You gain Command Points at the start of your Hero Phase, and in addition you start the battle with 1 Command Point per Warscroll Battalion that you include within your list. So there’s an incentive to build your list around a collection of Battalions. 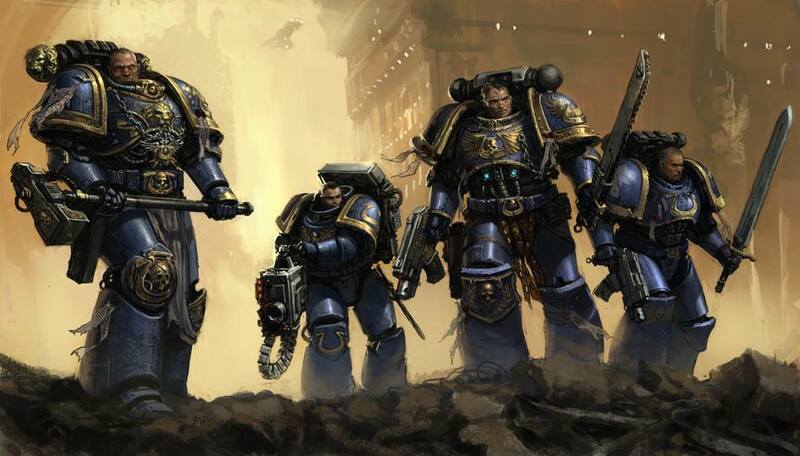 Unlike in 40k, there are unique Battalions available to each army, which are included in your Battletome and they grant you specific abilities if you meet the requirements for them – not only do you have to field the right amount and type of models, but they also cost points to include in your force. 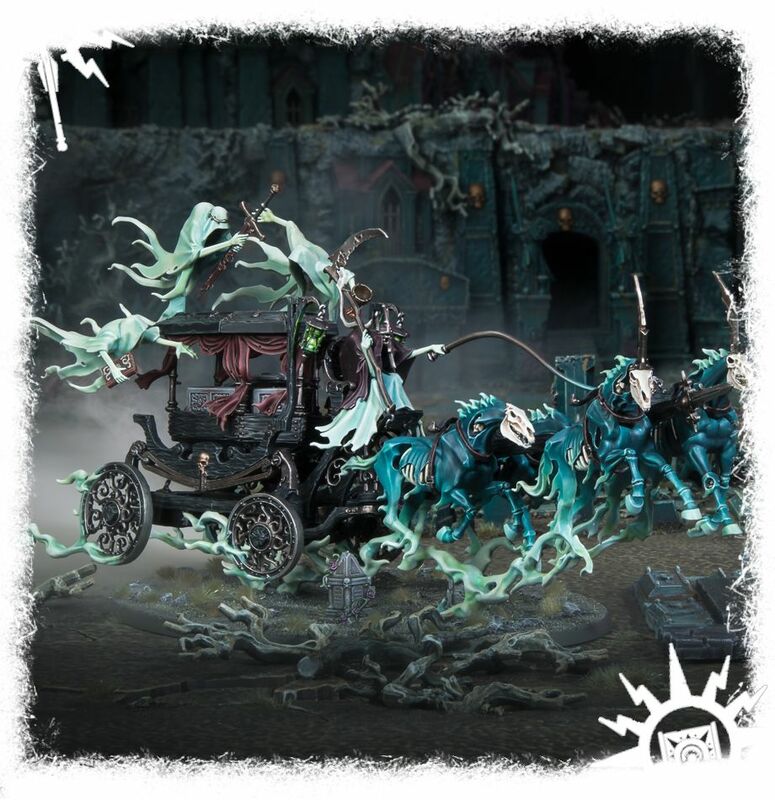 So, for example, in the Nighthaunt Battletome there is a Battalion called Deathriders, which requires 1 or 2 units of Dreadblade Harrows, 2 units of Hexwraiths, and 1 Black Coach. 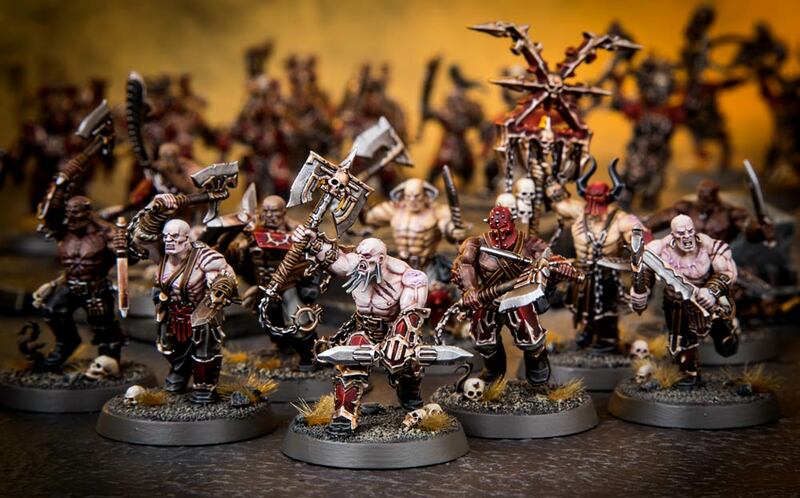 These models cost, at a minimum, 700 points (800 points if you go for the 2 Harrows), but you need to pay an additional 130 points to put them into the Battalion itself, which grants the ability to add 1 to charge rolls, and allows models from the Battalion to fight immediately if they make an unmodified charge roll of 9+. It’s basically the Wave of Terror allegiance ability (more in a bit), but will give you access to the ability if you take this Battalion in an allied army. I’ve built my own army to include two Battalions, which will allow me to start the game with 3 Command Points. Which will be handy, although I don’t actually have that many targets for unique Command Abilities! Let’s look at the list, anyway, and I’ll explain my thoughts a bit more. Version one has a total of six Leaders and four Battleline units, which meets the list building criteria as laid out in the General’s Handbook. Incidentally, how weird is it that the main rules for Age of Sigmar are laid out across two separate books? I mean, I kinda get it, in that the General’s Handbook is intended for the more serious gamers, and otherwise you can have a perfectly fun game by just using the core rules alone, but something as basic as list building should really be in the core rules, surely? Hm. I did really want to get Lady Olynder in this list, but sadly she wouldn’t quite fit. 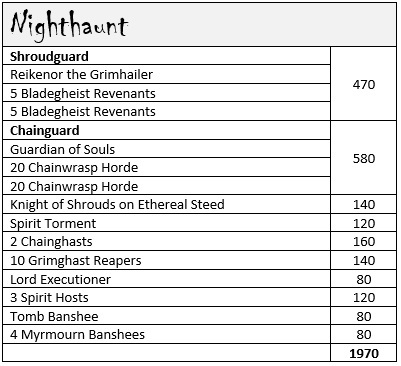 I suppose I could do away with the Spirit Hosts, and then replace the Knight of Shrouds with her, and it would still be a valid Battlehost list, but I think that’s probably for another day. My initial plans for the army actually revolved around Lady Olynder leading a banshee-based list, so I was planning to have Dreadscythe Harridans and Myrnmourn Banshees, with the Briar Queen hanging around as well, but that quickly became overshadowed by the desire to have a more broad Nighthaunt army! I do still want to have the Briar Queen in here at some point, but for now I’m actually planning to use her as the Tomb Banshee model, as I feel that particular model doesn’t really go with the rest of the range now. Same story with the Cairn Wraith really, and why I had been planning to use the Liekoron the Executioner model for him instead. But I digress. There are two Battalions in here, as I said, but while that does grant me 3 Command Points from the off, I only have the Knight of Shrouds who has a specific Command Ability, so the other heroes would be stuck with using the generic ones. 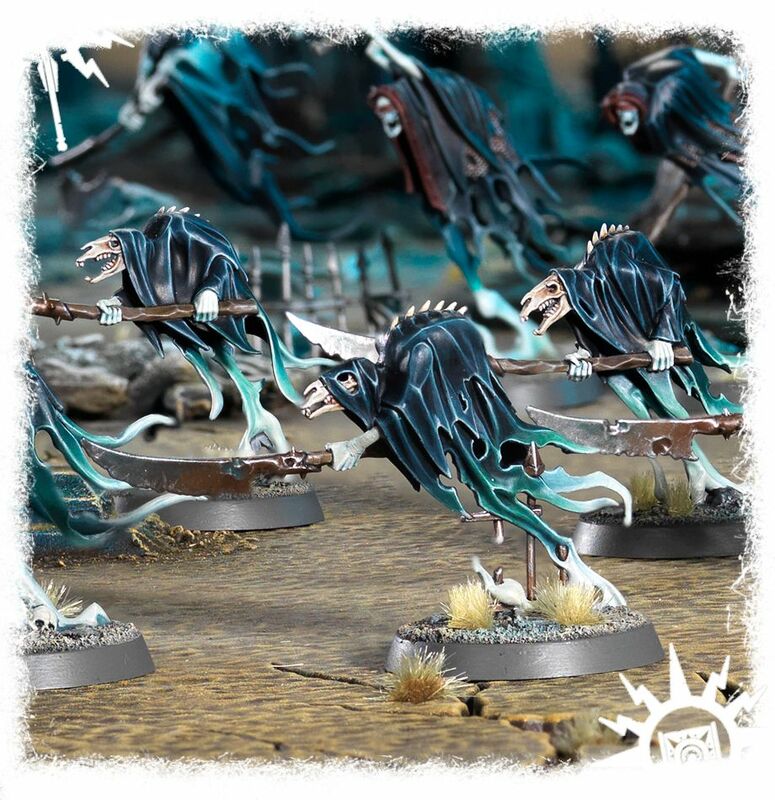 However, you can use the same Ability more than once, if you have the CP to do so, and the Knight of Shrouds grants Nighthaunt units wholly within 18″ of him +1 attack. So I can give out +1 attack to several different units each turn, so the basic Chainwrasps can dish out 3 attacks each, while the Spirit Hosts would each get 7 attacks if they were to be targeted with this Ability! Nice! While all of that is well and good, of course, I do still feel a little bit like I’ve been forced into it because of the Battalions – the generic Command Abilities are handy, but with only three unique Command Abilities in the entire army, I can definitely see myself dropping at least one of them (possibly the Shroudguard) at some point. I’m not sure what I’d replace it with, as I’m already at my max Leaders for 2000 points. 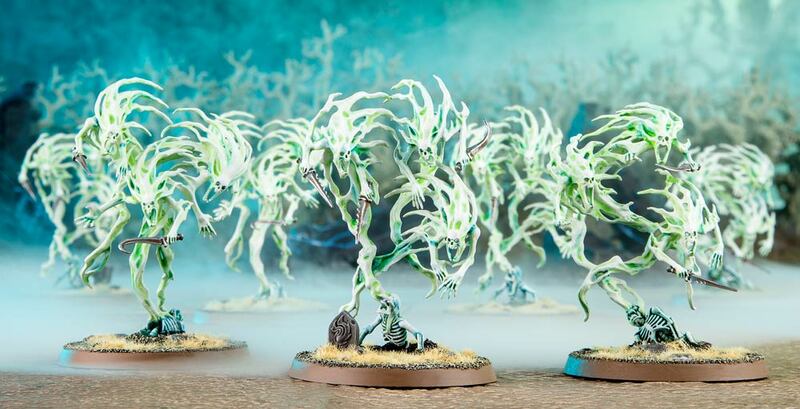 Possibly another unit of Spirit Hosts, and then maybe one of the Endless Spells, as they do seem to be quite fun – I know people seem to decry the Nighthaunt spells online, but having no experience with this, I’m all for trying out something new until I get into the groove with it all! 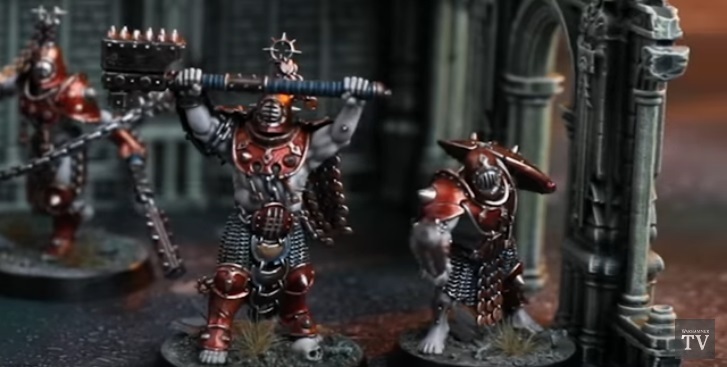 Of course, while the army is always made up of the units and the synergies that arise from them all, Age of Sigmar armies also have a whole host of additional stuff knocking about in the background, along the same lines as Chapter Tactics and their like for 40k armies. This is where things get really interesting, and I must say, it was a confusing part of the game to me for a long time! 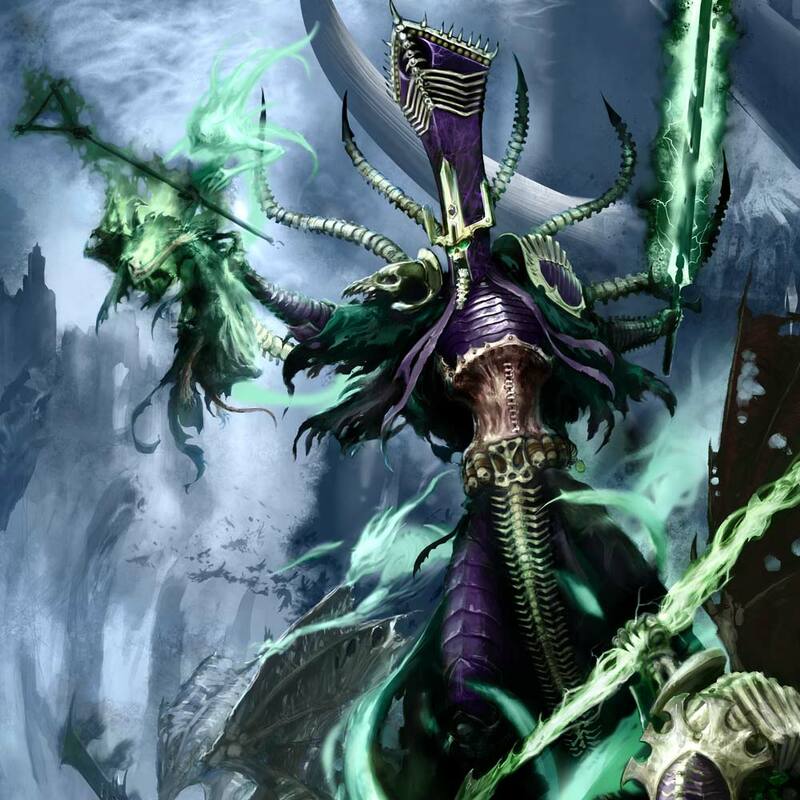 First of all, there are the Allegiance Abilities – a suite of six for the Nighthaunt, who do not have any kind of distinct sub-faction within the army. There are some powerful abilities here that are almost duplicated within the Battalions that I’m taking, which is why I’ve been thinking it might be quite easy to just ditch them if I feel I’m using up valuable points. Then there are unique Command Traits that can be given to the General. Remember when I said there were only three characters in the Battletome with their own Command Ability? Well, this will allow me to remedy that by choosing, say, the Guardian of Souls as the recipient of a Command Trait of his own. Importantly, unique characters cannot be the recipients of any of these things, so Reikenor the Grimhailer is out for receiving any further Command Traits or Artefacts of Power. For the purposes of my list, I’ve actually chosen the Knight of Shrouds as my General – for a long time, I considered nominating the Spirit Torment, but I think the Knight is a much more bellicose figure to lead the troops! While he does already have a Command Ability, there appears to be nothing preventing me from also giving him a Trait, so I’ve gone with Ruler of the Spirit Hosts, which allows him to return D3 slain models to a unit within 9″ of him. So I’ve got recursion from both the Guardian of Souls and the Knight of Shrouds, which is going to be useful! Certainly, the Guardian helped a great deal during my first game today, as I managed to keep one of my Chainwrasp Horde units from dying right up until the final battle round! I’ve got two Wizards in the army, Reikenor the Grimhailer and the Guardian of Souls. 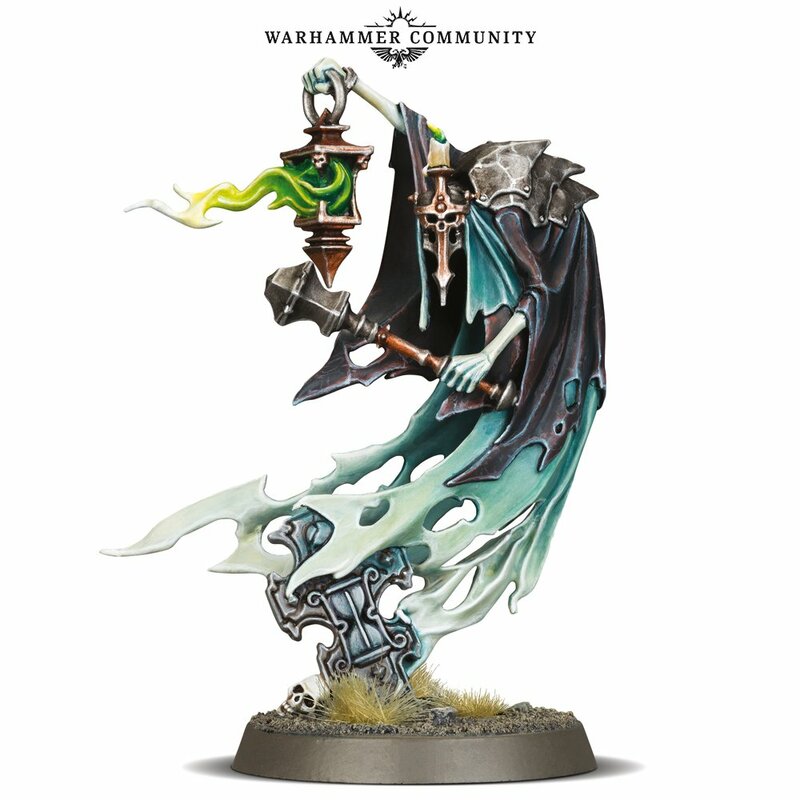 The Guardian has got the Spectral Lure spell that allows him to recur Nighthaunt models within 18″, while Reikenor can deal D3 Mortal Wounds to enemies within 12″ (with the potential for D3 more if the initial salvo slays any models). Both can only cast one spell per turn, and their unique spells are both really good. However, I can also give them an additional spell from the Lore of the Underworlds, so why not, right? I’ve given the Guardian of Souls the Lifestealer spell, which dishes out D3 Mortal Wounds on a unit within 12″, and allows me to heal him by the same number of Wounds dealt – as I need the Guardian ‘alive’ for his recursion spell, I think it’s a good enough gambit for him to take one turn off from doing that in order to heal himself in a pinch. Reikenor also knows Spectral Tether, which allows him to heal Nighthaunt Heroes within 12″ – as the most robust of all the units in the list (with 7 wounds), I figure he can be used to help keep others ‘alive’ as well. While were on the subject of the Guardian of Souls, there are also three different sorts of Infernal Lantern he can be given, under the Artefacts of Power (basically, Relics). I was using the Wychlight Lantern in today’s game, but kept forgetting about it (it wouldn’t have had any effect, anyway). However, I’ve now decided to give him the Beacon of Nagashizzar, which buffs his Spectral Lure spell to returning D6+3 models/wounds, rather than just D6. So I’m guaranteed to get at least 4 models back, or heal 4 wounds, which is just incredibly powerful when dealing with this many Chainwrasps or pulling a Hero back from the brink. 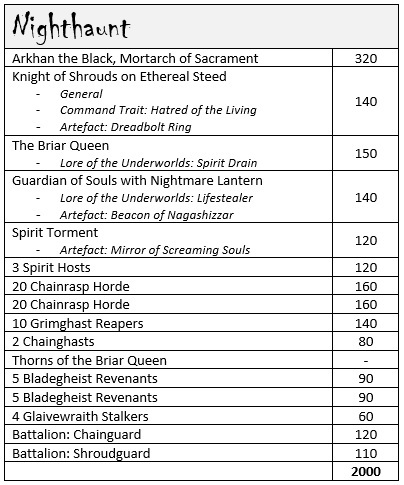 I have the option of adding one additional Artefact of Power for each Battalion in the list, of course, so I’ve gone for the interesting choice of making the Tomb Banshee a wizard through the Midnight Tome – she knows Spirit Drain, which rolls a D6 equal to the wounds characteristic of an enemy unit within 18″, and deals out a mortal wound for each 6+. Finally, I’ve given the Knight of Shrouds Headsman’s Judgment, adding 1 to hit and to wound for his Sword of Stolen Hours. So that should be quite fun! So that’s the army plan that I’m working on right now! I’ve got my work cut out, of course – it’s a total of 75 models to paint, and detailed ones at that! I still need to buy some Spirit Hosts, and another box of Chainwrasps, as well as the Bladegheist Revenants. But I’m looking forward to the task, as the models are really quite wonderful to paint, and should look fantastic as an army when they’re finished. In the meantime, I’m hoping to get some more smaller-scale games in as I try to learn more of the intricacies of the game – Age of Sigmar has come a long way since I first tried it out back in 2016, and while many people still seem to think of it as something of a simple game (in my local area, at least), I feel like there is a lot more to it than perhaps I’ve seen so far. Having played one basic game at a very low-cost points level, I’ve only scratched the surface, so I’m looking forward to more! 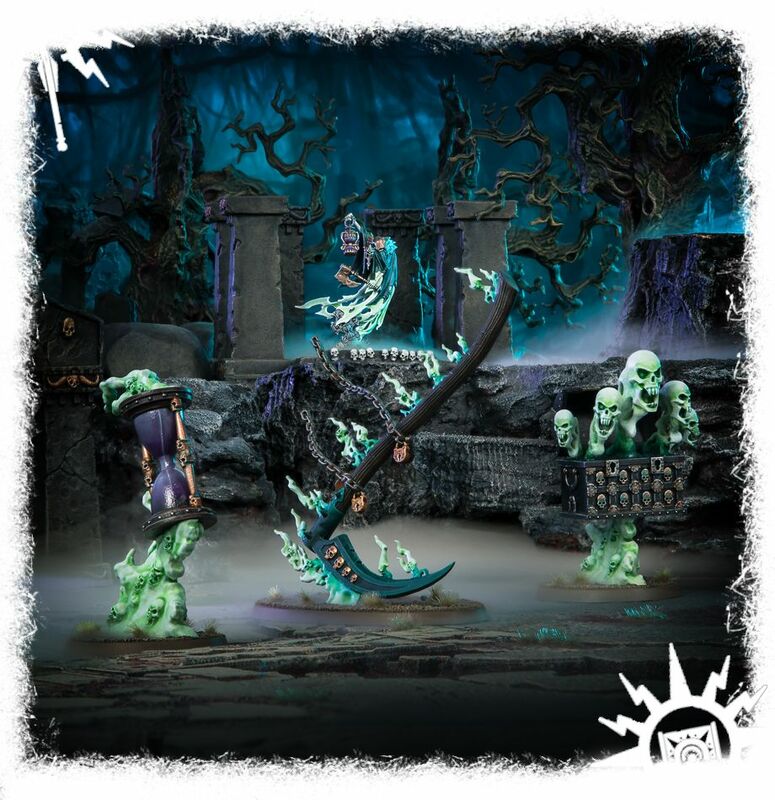 Author spalanzPosted on January 9, 2019 Categories WarhammerTags Age of Sigmar, hobby progress, Nighthaunt, Warhammer1 Comment on Nighthaunt Updates!